When it comes to an overall great hair straightening experience, the Miropure straightener brush delivers. Right out of the box, you’ll find this straightener offers far more than a sleek red and black design. 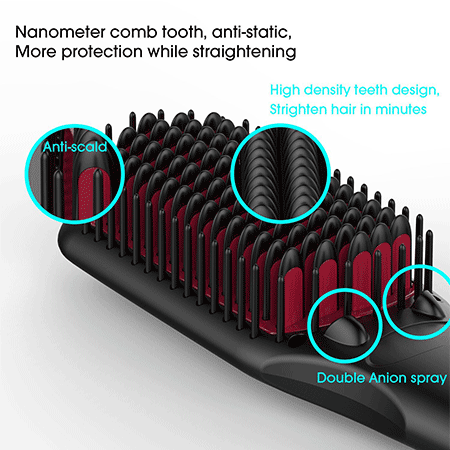 Upon close inspection, you’ll spot the nano-comb brush with anti-static technology, which eliminates frizz as it combs through your hair. And if that’s not enough, the double ionic generator will grant your hair that soft and silky look that comes from a salon. A really nice touch here is the brush’s teeth–they’re close enough together and wide enough that your hair can receive a nice sleek finish. As a whole, the interface is pretty nice as well. For starters, you’ll find only the classic three buttons (plus, minus, and power), so it won’t take too long to figure out how everything works. Furthermore, you’ll get five heat settings ranging from 150 to 230 degrees-Celsius. Thus, there’s a temperature setting here for any existing hair type. You’ll even find a nice auto-shut off feature for some added safety. As far as heat-up times go, you won’t be waiting any longer than a minute. But keep in mind that it’s a bit difficult to determine when the iron is fully heated. If we were to complain about anything, it would definitely be the sensitivity of the buttons on this brush. As a whole, it’s pretty easy to accidentally push the power button while straightening your hair—and yes, this happens even with the temperature lock in place. But as some nice compensation, this iron will come with all the essentials to get your hair looking great. Out of the box, you’ll also find a heating mat and glove for easier handling. Hard to tell when it’s fully heated and ready for use. 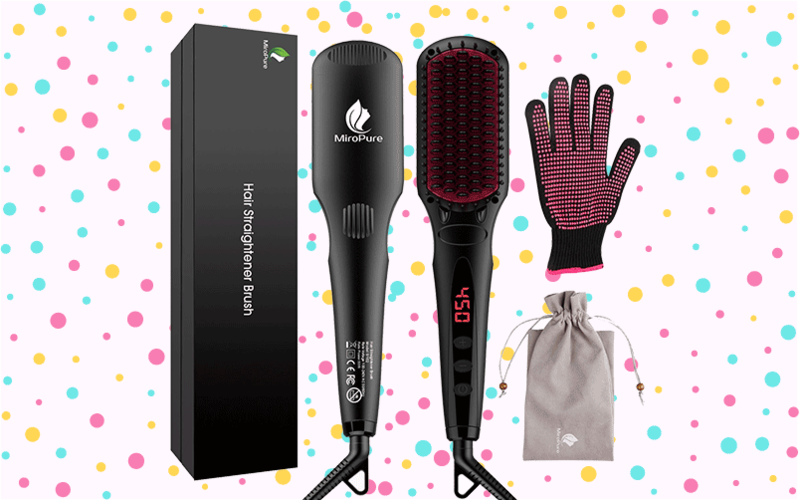 If you’re looking for a hairbrush that straightens hair, then Miropure has quite the product for you. Overall, we found this product to offer a setting for just about every hairstyle out there. And if that’s not good enough, this brush simply feels good to use. Unfortunately, this straightener suffers from overly-sensitive buttons. But once you work past this issue, you’ll find it does a fantastic job of styling your hair while removing frizz.